Stay tuned, because tomorrow I will be on Studio 5 talking about the ever popular slow cooker!! In the JCPenney ad that came in the mail last week (see above picture of what the mailer booklet looked like) there was a coupon good for $10 off a $10+ purchase. You have to clip the coupon and take it in with you to the store, or you can use the Promo Code: TEN2YOU when shopping online at jcp.com to get the discount. This coupon is valid August 8 - 24th, and will help out with all the Back-To-School shopping that needs to be done this time of year! Again, these coupons can be presented at check-out in the stores, or use Promo Code: 2GOBACK when shopping online. When I was on Studio 5 last week, I met Stephen Jones, star of the mega-hit video (nearly 2 million views on YouTube) that has been making the news. He was so gracious to let me take his picture. Such a gentleman. Today on Studio 5 I demonstrated a Blackened Chicken Salad and Dressing that has been the hit of the summer. Double the dressing when you make it at home....I can pretty much guarantee you'll need it:) Click here to get the full recipe. P.S. The salad dressing was not my creation...visit Brooke McLay at her wonderfully creative cooking blog www.cheekykitchen.com. Congratulations Mary!! Send an email to couponjanet[at]gmail[dot]com with your mailing address. Include the subject line of "Cookbook Winner", and I'll autograph a copy and get it in the mail! To the non-winning commentors, I now have the ability to sell cookbooks thru my recipe blog, Slowcooker101.blogspot.com . You can order autographed copies from here. Or you can look for the book at your local bookstore on August 1st! Disney is offering a $10 off coupon for the Blu-Ray/DVD combo pack of "James and Giant Peach" which comes out on August 3rd. To get the coupon, find your current DVD or VHS copy, and jot down the barcode number (I don't have a copy myself, so I went to a neighbor who did, and copied down the barcode number). Then you can log into Disney Movie Rewards and either sign-up, or enter your account, and from there will be directed where to go to enter your barcode number and print your coupon. Printed coupons are valid from August 3 - 17, and are only good for the Blu-Ray/DVD combo edition. I have seen this posted other places, but since I actually did this myself, I'll post about it. The Bingham Canyon mine (Kennecott Copper) is free to the public until July 25th. Normally it's $5 per car, so it's a great deal. They have a little visitor's center with a short 10 minute video you can watch (and learn) about what goes on at the mine, and how it all works. Plus it was pretty amazing to be able to look down into a 3/4 of a mile hole in the ground! Everyone loves free stuff, right? I mean, that's part of why you come to check out this blog -- to see different ways to save money and get things free, when possible! So why don't we have a giveaway? To be entered in the prize drawing, leave a comment with the details of a recent couponing deal you found, heard about, or benefited from. The winner will be selected from the comments received, and I'll contact the winner for their mailing address. Simple as that! Make your comments by July 24th, and I'll get the book in the mail to the winner on the 26th! I know this blog has been the neglected child as of late, with the kids out of school for the summer, being in charge of family reunions, and trips to Alabama. I'll try to do better! Here's some good news, though....my new book comes out on August 1st, 2010!! My publisher has taken my two slowcooker books, and combined them into a single volume! This hardback, spiral bound book features a cute new look, updated helpful hints, and a fantastic index for finding those favorite recipes by name OR by ingredient! You can pre-order them thru the Amazon.com link below, or look for it in stores on August 1st! My sister and brother-in-law took us to a little restaurant several months ago, and from the first bite, I was hooked. It's called SMASHBURGER, and it is the best hamburger I have ever eaten. They have opened up a few stores around Utah (the one in Orem across from University Mall is the one that gets my business), and I saw that they were having some pretty awesome promotions in May, so I thought I'd let you know about them. 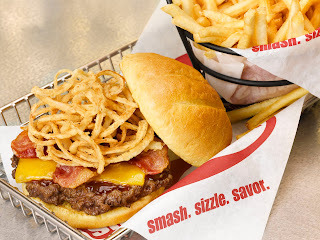 From May 17th-20th, you get a free kids meal (choose from Smashdog, Smashburger, Grilled Cheese or Chicken fingers) with the purchase of any Smashburger entree. Bring the whole family! And on May 25th, get a free 1/3 lb. All-American Smashburger (100% Angus beef, American cheese, ketchup, mustard, onion, pickle, served on an egg bun ),when you purchase an entree. Anyway, just thought I share some "burger-love" with you all. 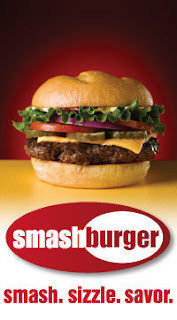 Maybe I'll see you at Smashburger one day soon!